The tea estate seems an appropriate setting for an Oriental fable because of the ambience that makes a willing suspension of disbelief possible. 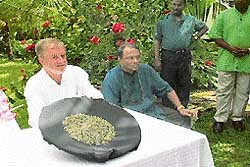 The Handunugoda tea estate of planter Malinga Herman Gunaratne in Tittagalla, a part of the Galle province, about 160 km from Colombo is the place where recently the world’s most expensive tea, white tea, was launched. A professional planter working for British sterling companies for over 25 years, Herman, after nationalisation, was appointed Regional Manager of the Nuwara Eliya Region, Sri Lanka’s prime tea region. 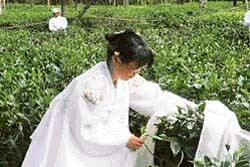 He was in charge of 67,000 acres of the Island’s best tea lands. The estate has been with Herman’s family for more than a century, it was in Nuwara Eliya district of the Central Province that he learned to update his skills as a planter. Kilburn, a tea historian, lives in Seoul with his Korean wife Jade and is Chairman of the Tea Museum there and had, on a visit to far off tea lands, heard of this ancient practice of growing white tea. He suggested that Herman should try to grow it on his estate. The idea of reviving the ancient practice was further reinforced after Kilburn’s visit to the city of Grass in France where he met a famous Nose (a man who noses perfumes and has the ability to differentiate between the different ingredients which go into the composition of a perfume). The Nose had before him many canisters of jasmine perfumes from different countries. When Kilburn asked him about the difference between these perfumes because they were all derived from the same jasmine flower, the Nose had answered, “The only difference is the difference in the smell of sweat from the hands of the pickers of flowers from the various countries.” It was obvious that the ancient Chinese had mastered the art of making teas uncontaminated by sweat or oil from human hands. If the same was to be repeated, it would definitely create a storm, felt Kilburn. Named after Kilburn, whose inspiration had motivated Herman, Kilburn Imperial is a white tea because it is not fermented and put through a process of firing but allowed to wither in the sun. The tender-most innards of the tea bud (the bush is a secret) are prised out with gloved hands to be sun-dried under surgically sterile conditions, without any direct contact with human hands. Connoisseurs will have to pay through the nose for the white tea since it is priced and retailed at a staggering 1250 US$ per kilo while the whole sale price is around 750 US$, 750 times more than the average price of high-quality pure Ceylon tea.